Polemicscat's Weblog | Examining settled and unsettling questions. The Obama "birth certificate" is fabricated. The birth certificate issue is linked to other of Obama’s documents the American public is not permitted to see. The college records undoubtedly reveal more than Obama’s grades. Only an insane person or a person who has a lot to hide would take all the steps and go to the expense that Obama has to keep his biography a secret. His college records alone would include information on how Obama’s education was funded and who paid for that education. They would tell us whether he received tuition and other moneys as a foreign student. Answers to these questions are important. Ultimately they are more important than the state of our economy this week and more important than the foreign wars we are involved in. Because Obama is at the heart of our government, he has access to the nation’s most important documents. And he has the power to act on his contempt for the United States. The public has a right to know what Obama has expended so much money and effort to hide. Yet, the main stream media are not even curious. Fort Hood Shooter: the Kind of Soldier U. S. Needs? Sanity returns to three leaders of European Countries, but not to the elite and their sycophants in the United States. It seems United States leaders and our military officers have poor skills in identifying the enemy. What power is there over members of the Senate and over the officers in our military that causes them to turn a blind eye and a deaf ear to the REAL THREAT to our safety, our freedoms, and our culture? ANSWER: It has to come from the highest authority of our government: our Kenyan, Muslim President. For any reasonable person who reads this excellent piece from the Wall Street Journal, there can be do doubt where the problem lies. Every branch of the military issued a final report on the Fort Hood massacre. Not a single one mentioned radical Islam. In a month of momentous change, it was easy to overlook the significance of another revolutionary event. Who would have believed that in the space of a few weeks the leaders of the three major European powers would publicly denounce multiculturalism and declare, in so many words, that it was a proven disaster and a threat to society? One after another they announced their findings—Germany’s Chancellor Angela Merkel, Great Britain’s Prime Minister David Cameron, and France’s President Nicolas Sarkozy. Multicultural values had not only led to segregated communities: They had, Mr. Cameron noted, imposed policies of blind toleration that had helped nurture radical Islam’s terrorist cells. There can be no underestimating the in-so-many-words aspect of these renunciations. This was multiculturalism they were talking about—the unofficial established religion of the universities, the faith whose requirements have shaped every aspect of cultural, economic and political life in Western democracies for the last 50 years. Still, they were out there—words coolly specific, their target clear. They came at a fitting moment, just as Americans had been handed a report providing the fullest disclosures so far about the multiculturalist zeal that had driven Army and medical school superiors to smooth Nidal Malik Hasan’s rocky way through training, promote him, and, despite blatant evidence of his unfitness, raise not a single concern. Maj. Hasan, U.S. Army psychiatrist, would be assigned to Fort Hood where, in November 2009, he opened fire, killing 12 fellow soldiers and a civilian employee, and wounding 32 others. 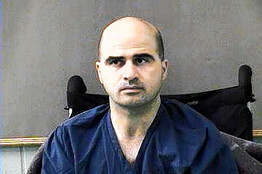 Maj. Hasan at the Bell County Jail after his shooting spree at Fort Hood. In this report, titled “A Ticking Time Bomb” and put out by the Senate Committee on Homeland Security and Governmental Affairs, there is a detail as dazzling in its bleak way as all the glowing misrepresentations of Dr. Hasan’s skills and character, which his superiors poured into their evaluations of him. It concerns the Department of Defense’s official report on the Foot Hood killings—a study whose recital of fact made no mention of Hasan’s well-documented jihadist sympathies. Subsequent DoD memoranda portray the bloodbath—which began with Hasan shouting “Allahu Akbar!”—as a kind of undefined extremism, something on the order, perhaps, of work-place violence. This avoidance of specifics was apparently contagious—or, more precisely, policy. In November 2010, each branch of the military issued a final report on the Fort Hood shooting. Not one mentioned the perpetrator’s ties to radical Islam. Even today, “A Ticking Time Bomb,” co-authored by Sen. Joe Lieberman (I., Conn.) and Susan Collins (R., Maine), reminds us that DoD still hasn’t specifically named the threat represented by the Fort Hood attack—a signal to the entire Defense bureaucracy that the subject is taboo. For the superiors in charge of Hasan’s training at Walter Reed and his two years at Uniformed Services University of the Health Sciences, the taboo was of a more complicated order—one that required elaborately inventive analyses through which Hasan’s stated beliefs, ominous pronouncements, and evident unconcern with standards of behavior required of an officer could all be represented as singular virtues, proof of his exceptional value to the Army. It could not have been easy. Still, they managed. They did so despite Hasan’s astounding trail of performances, each more telling than the next. To fulfill Walter Reed’s academic requirement for a presentation on a psychiatric theme, Hasan proffered a draft consisting almost entirely of wisdom from the Quran arguing for the painful punishment and liquidation of non-Muslims. Hasan evidently viewed the Quranic verses as a sufficient presentation—a view his superior didn’t share, given its lack of any mention of a psychiatric theme. When that guide warned him the presentation was “not scholarly” and might prevent his graduation, Hasan revised. The finished product was not much different. Still, Hasan was allowed to graduate. He went on to his medical fellowship, where he soon delivered another class lecture, this one on the Islamist theme that the West, in particular the U.S military, had mounted a war on Islam. The presentation brimmed with views sympathetic to Osama bin Laden, the motives of the 9/11 perpetrators, and suicide bombers. It so infuriated his classmates that their outraged eruptions caused the instructor to end the presentation. There would be more of the same to come. One classmate witness told investigators that Hasan sought every possible opportunity to share his radical Islamist sympathies. His highest obligation, he told classmates, wasn’t to the Constitution, which he had sworn to protect and defend, but to his religion. His Islamist sympathies would attract the interest of the FBI, which soon picked up on this U.S Army major’s contacts with a terrorist suspect, unnamed in the Senate report. The agency would, however, have no continuing great interest in Hasan. Among other reasons, its agents had seen the impressive evaluation reports characterizing Hasan as an authority on Islam—one whose work even had “extraordinary potential to inform national policy and military strategy,” as one of his superiors put it in his officer evaluation report. The same Hasan who set off silent alarms in his supervisors—the Psychiatric Residency Program Director at Walter Reed was one of them—would garner only plaudits in the official written evaluations at the time. He was commended in these as a “star officer,” one focused on “illuminating the role of culture and Islamic faith within the Global War on Terrorism.” One supervisor testified, “His unique interests have captured the interest and attention of peers and mentors alike.” No single word of criticism or doubt about Hasan ever made its way into any of his evaluations. Some of those enthusiastic testaments strongly suggested that the writers were themselves at least partly persuaded of their reasoning. In magical thinking, safety and good come to those who obey taboos, and in the multiculturalist world, there is no taboo more powerful than the one that forbids acknowledgment of realities not in keeping with the progressive vision. In the world of the politically correct—which can apparently include places where psychiatrists are taught—magical thinking reigns. A resident who didn’t represent the diversity value that Hasan did as a Muslim would have faced serious consequences had he behaved half as disturbingly. Here was a world in which Hasan was untouchable, in which all that was grim and disturbing in him was transformed. He was a consistently mediocre performer, ranking in the lowest 25% of his class, but to his evaluators, he was an officer of unique talents. Ms. Rabinowitz, a member of the Journal’s editorial board, is the author of “No Crueler Tyrannies: Accusations, False Witness And Other Terrors Our Times” (Free Press, 2003).